We’re looking forward to exhibiting at the Farm Business Innovation Show 2017. There are just a few finishing touches to be made and we’ll be ready for the two day event on 8th and 9th November at the NEC, Birmingham. Over two days this is the place where rural, land or business owners can source a wealth of information and advice on funding, grants, planning, new products, new services, new ideas, troubleshooting, business tips, marketing tools, networking, inspiring keynote sessions, like-minded professionals, potential partnerships and so much more. The show is aimed at a variety of people primarily in the rural sector looking to bring in more money, either from their land or property. The Artisan Food Trail sits nicely into this area which is the reason why the show organisers asked us to team up with them and become a partner. Not only will there be over 500 suppliers exhibiting but also over 200 free seminars all with your business in mind. 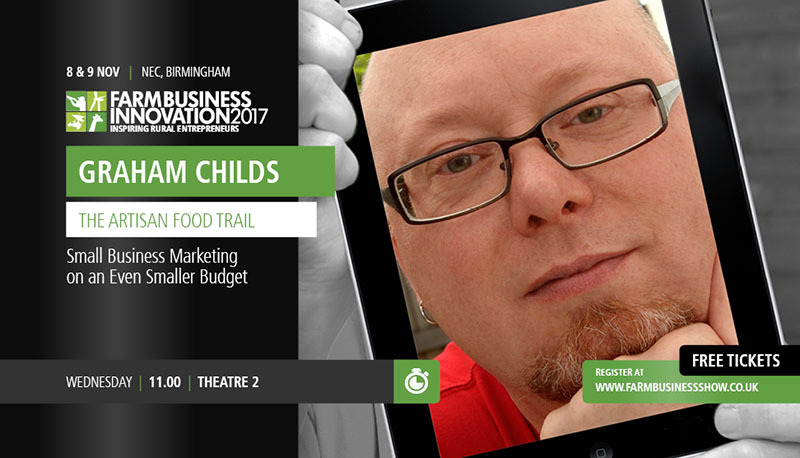 Our very own co-founder Graham Childs will be talking on the first day, sharing his knowledge on marketing and how it can be done on a small budget. Read more about the seminar here. Who should visit The Artisan Food Trail stand at Farm Business Innovation Show? The Artisan Food Trail promotes and champions small and artisan food and drink producers throughout the United Kingdom. We create awareness of their brand and their produce. By supporting businesses with a number of member benefits we can help make running your business easier and more cost effective. As you can see, we offer a wide range of services and you don’t need to be a member of The Artisan Food Trail to take advantage of them. Even if you don’t see exactly the service that fits your description above, you can still come and talk to us. We’ve found out ourselves, that you never know who you’re going to meet at these types of events and often a conversation can lead to a positive outcome. The show is completely FREE to attend and all you need to do is register for your ticket. Visit the Farm Business Innovation page on our website where you’ll find a link to register.